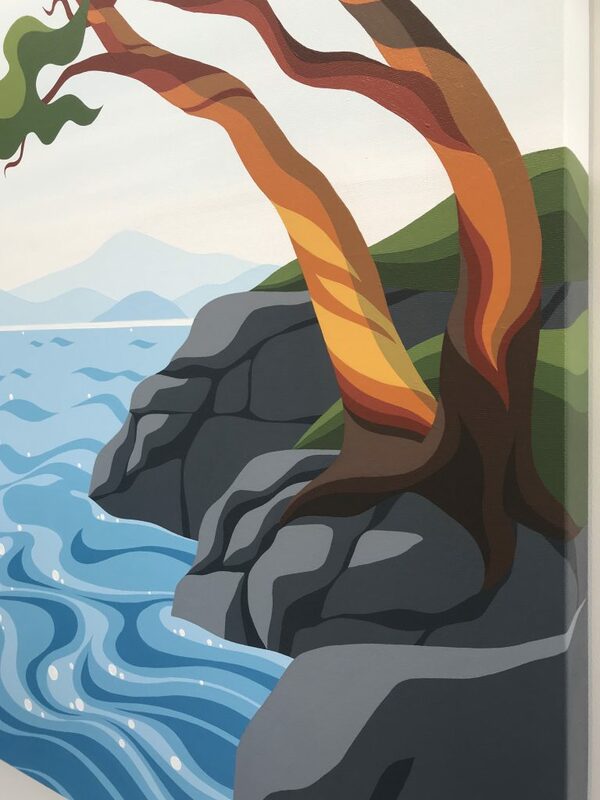 I cannot help but be inspired every time I visit the south side of Bowen Island. The dry rocky bluffs, expansive views over Georgia Straight, Salish Sea and Vancouver Island. Sunlight and warm ocean breezes. Dare I say it might just be the perfect place to sit and let your mind wander over the ocean, watching the Horseshoe Bay/Nanaimo ferry as it makes its way slowly back and forth to the island. It is not uncommon to see whales along here- orca, humpback and porpoise. Seals play in the kelp forests and sea birds are plentiful. Yet most beautiful is the iconic arbutus – growing steadily among the lichen and salal covered rocks. 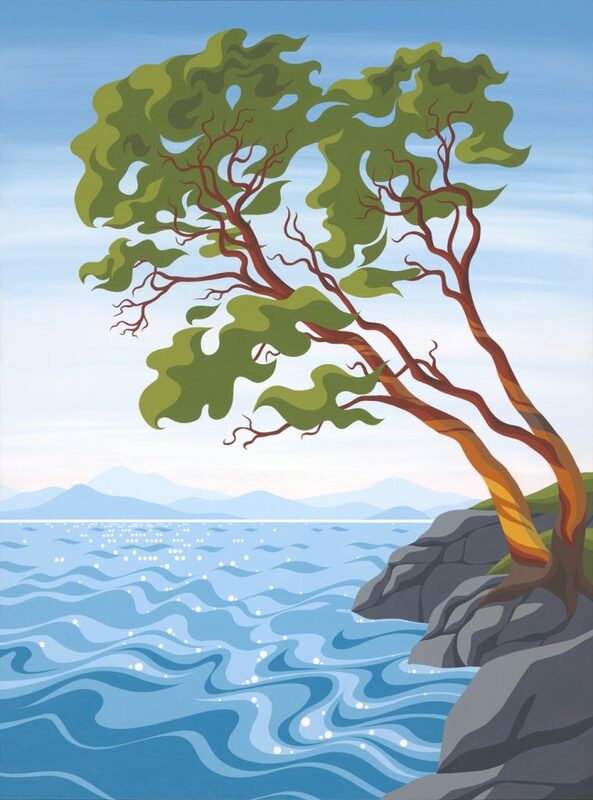 So I was inspired for this latest westcoast contemporary landscape: ‘Pacific Madrone II’. 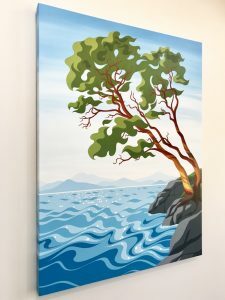 The Pacific Madrone, Pacific Arbutus or Arbutus menziesii is a species of evergreen tree native to the North American west coast; inhabiting rocky coastal bluffs from British Columbia south to California. Their iconic bark peels into brilliant shades of yellow, yellow-green, orange, red and rusty brown. They can live up to 250 years and when fully mature grow up to 100 feet in height with trunks 5 to 8 feet thick. You often see these younger, twisted trees clinging along the coast, leaning out towards the salt air they so love. 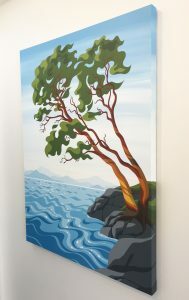 Come see this latest artwork available exclusively at the Catching Stars Gallery on Bowen Island, British Columbia. Gorgeous work, as always, Di! I do nit thunk I have ever seen seen such an amazing image of what I call an arbutus tree. You have the ability and talent to see the essence of a scene and create an image is distinctive and unforgettable. Thank you fir including me in your distribution list.